Men Wot Sing - Our History - Incredibly Well Sung! Early in 1999 Peter Whitcombe, who at the time was heavily involved in various support groups for men around the NSW/Qld border region, acted on a personal whim to sing and so set about creating the foundations for what has now become Men Wot Sing. Discussions with volunteers and other participants within the men’s support network showed that there were other men who, likewise, were also interested in singing. Through a friend who had attended a "Hear You Male Voice" vocal workshop, held on the Sunshine Coast, Peter first heard of the name Brian Martin, the facilitator of the workshop. Subsequent contact with Brian and his enthusiastic support led to his appointment as the Musical Director of what was envisioned as a permanently established all male choir for the SE Qld/Northern NSW area. Brian Martin - Singer/Composer/Teacher/Musical Director. Brian Brian has a BA in Contemporary Music majoring in Voice, and a long history of performance as a member of many choirs, vocal ensembles and as a pianist. He has taught the Mouth Orchestra & Master classes at QUT, Brisbane, and vocal workshops, sight singing and body percussion at the Lismore Conservatorium. He has also conducted numerous choirs and run singing workshops with partner Tess Cullen in NSW and Qld, and has also been a regular tutor for Camp Creative and many other festivals including Woodford and Manshine. His vocal workshops concentrate on opening up the voice through confidence and technique, looking at understanding the elements involved in a cappella singing. His training as an N.L.P. Practitioner and Pranic Healer helps to facilitate the deeply healing experience that involves movement, rhythm and lots of laughter. Brian's initial attraction to becoming the musical director of a permanently established all male choir was the uniqueness of such a project. Having previously participated and directed several mixed choirs, and conducted many singing workshops, the opportunity to develop a group of men singing in harmony on a regular basis would be something new. Secondly he saw it as a challenge! “I wanted to see if I could do it.” As it transpired when the group had gown to around 25 in number, apart from Brian, only one other participant could read music and none of the members had any musical or singing experience. Thirdly, Brian saw it as an opportunity to teach men to sing. It was apparent, and probably still is today, that with most choirs and singing workshops the women outnumber the men by a large majority. Brian believed that more men would become involved by creating a safe, friendly and supportive singing environment. Now with willing participants and a competent Musical Director the next step was to secure a suitable venue for rehearsals. Following up on various leads eventually the St Andrew's Presbyterian Church in Florence St, Tweed Head, was secured and the first of the fortnightly rehearsals, of what was then known as "Ancestral Tones", was conducted on the 16th of February 1999. Now with willing participants and a competent Musical Director the next step was to secure a suitable venue for rehearsals. Following up on various leads eventually the St Andrew's Presbyterian Church in Florence St, Tweed Head, was secured and the first rehearsal, of what was then known as "Ancestral Tones", was conducted on the 16th of February 1999. Peter Whitcombe, Andrew Hogg, Michael Beatty, Bill Lee Emery, Neville Brown, Chris Walton, Marty Rubenstein, Craig Pickstone, Grant Griffin, Adrian White, David Tweed, David Morgan, Peter White and Murray Sutton. It soon became apparent, however, that St Andrew's was not the ideal location for rehearsals due to the lack of acoustics and the volume of the traffic noise from the nearby highway. So, after only two or three rehearsals, the decision was made to find a more suitable venue. 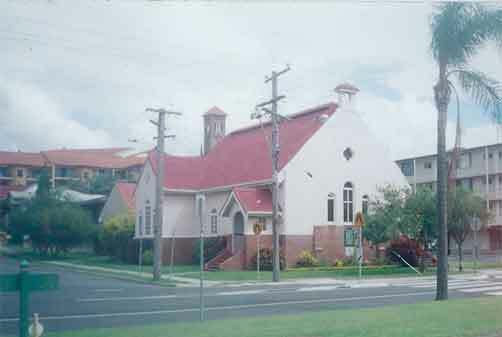 In March 1999 rehearsals began at the new location of St Peter's Anglican Church, on the corner of Lanham and Dutton Streets in Coolangatta. With a much better acoustic quality and minimal external noise interference this location was ideal for the budding singers. The initial naming of the group came about from a suggestion put forward by one of the founding members, Andrew Hogg. Most of the songs that the group first rehearsed were traditional songs from various cultures, particularly African and American Indian. The name Ancestral Tones was adopted because of its link to tradition and sound.